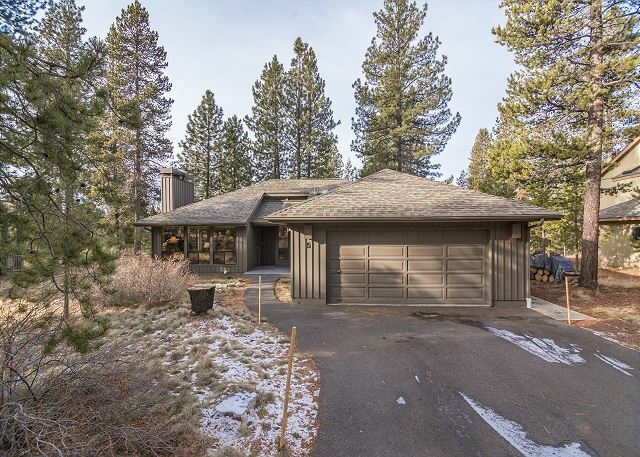 This modern, light and bright single level home is located on Sunriver's North end close to the North Store & Benham Falls. 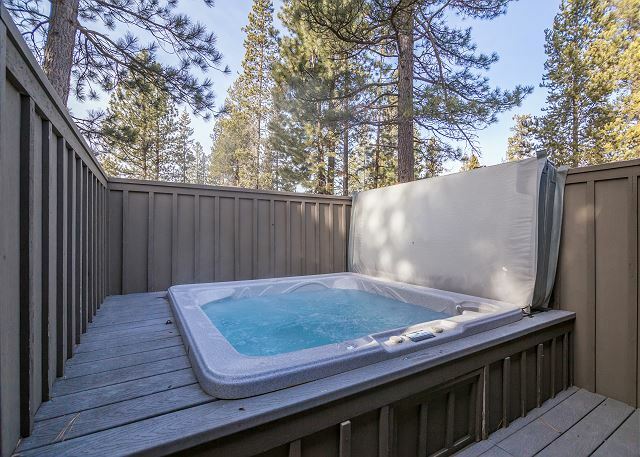 Relax in your private hot tub or grab the bikes and ride Sunriver's 30 miles of paved bike paths. 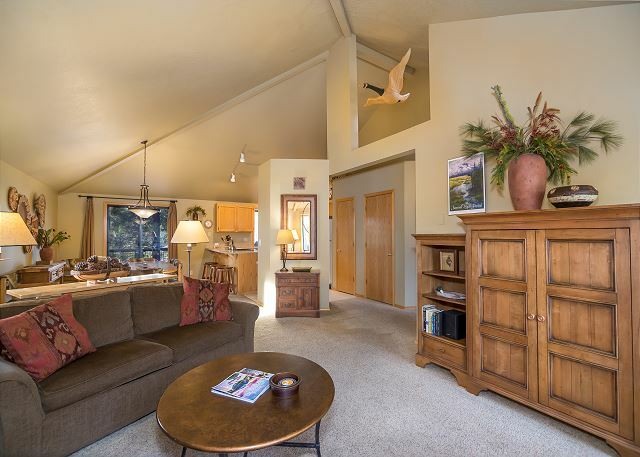 1 King, 1 Queen, 2 Twins, 1 double HAB, all new mattresses 5/06, 2TVs/2VCRs, DVD player, CD stereo, D/W, W/D, microwave, HOT TUB, gas BBQ, fireplace, garage, bikes, pet friendly, 1 level. NO PETS OVER 100 LBS. 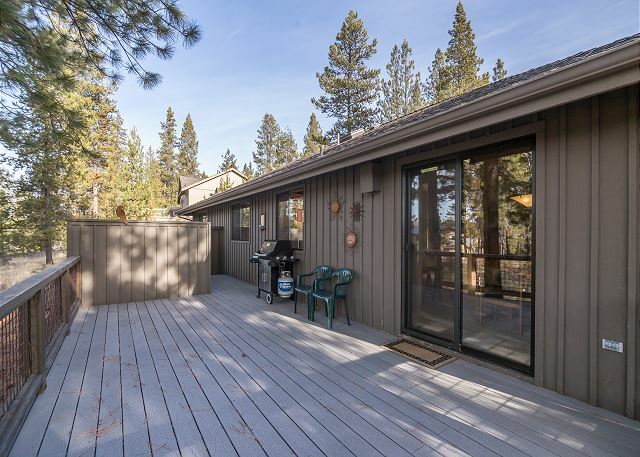 Wonderful cozy home conveniently located in Sunriver. Keyless entry convenient. Hot tub on deck a bonus. Plenty of firewood for fireplace. Wish they had more convenient recycling for bottles and cans. Thank You for your 5 star Review, George! 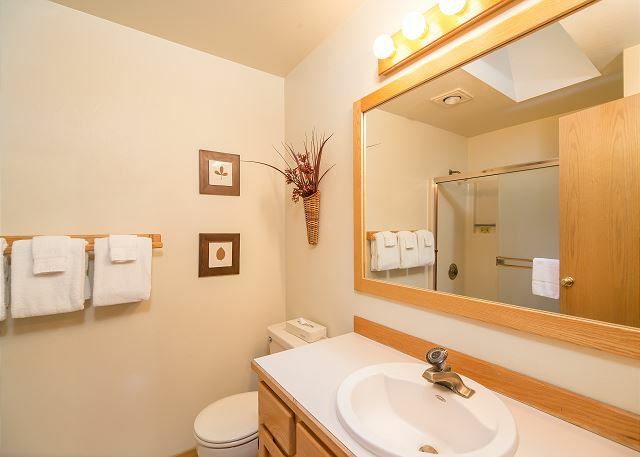 Glad to hear that the convenient location and keyless check in was well received, and that you found the home to be wonderfully cozy with ample firewood and utilized the private Hot Tub. We would love to host you again, Come back soon! Nice home with good space for family. We were challenged to get the home cool enough for sleeping at night as the weather was so wonderful during the day. Located close to SHARC but longer bike rides from places we love like the river and even the mall. Quiet neighborhood was relaxing for us though! Thank You for your Review! Glad to hear that you enjoyed the home and space with your family! We hope to see you again! Perfect one level home that was excellent for our two young children. We also had four adults and this home were so comfortable. House is fully equipped with everything that we needed. Kitchen was stocked full of everything you could imagine. We cooked 80% of our meals at the house and was so happy to have all the kitchen tools. Hot tub was amazing and very clean. House even had fans for each room and kept very cool. Thank You for the wonderful detailed 5 star Review, Chelsea! So glad that you enjoyed this wonderful, well stocked home and found it comfortable, clean and cool! We hope to host you again! Thank You for the 5 Star Review, John! Happy to hear that you had a great stay! Come back soon! Thank you for your review Randy! We are glad to hear that you had another great time at Hart Mountain 5! Hope you will be back for a 3rd! House worked great for our family. Beds comfortable. House very clean. 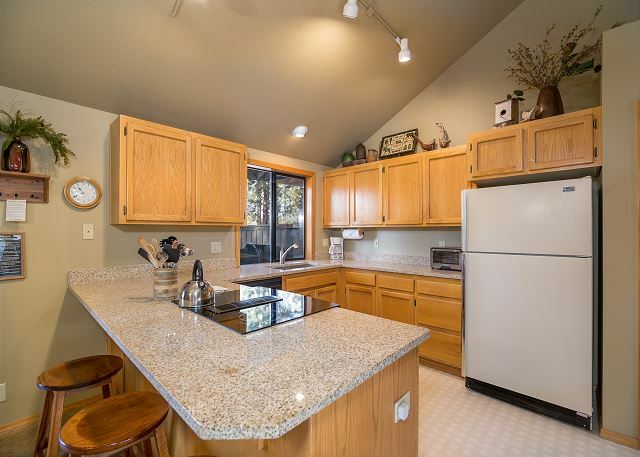 Kitchen well equipped with just about anything you would need including crock pot, electric griddle, many pots and utensils. Nice to have garage available to store bikes. Bikes available in garage but we brought our own. Would stay again at this hous and very happy with Sunset Lodging for rental. Thank You for your review! We love when guests find their accommodations more than pleasing and well stocked! 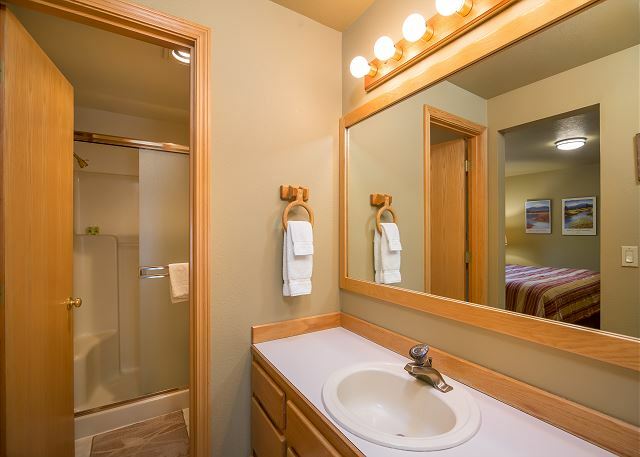 We do our very best to make sure that guests have everything that they need and would love to host you again in Sunriver. Come back soon! Everything was great about this property except for the fact that there was not any ceiling fan let alone air conditioning. It was brutal half the week because there was no air movement so the house didn't cool down even at night with all the windows open in the desert. We were very active being gone most of the day to swim or go on bike rides but the time between getting home in the late afternoon and throughout the night were somewhat miserable due to the lack of air flow in this house. 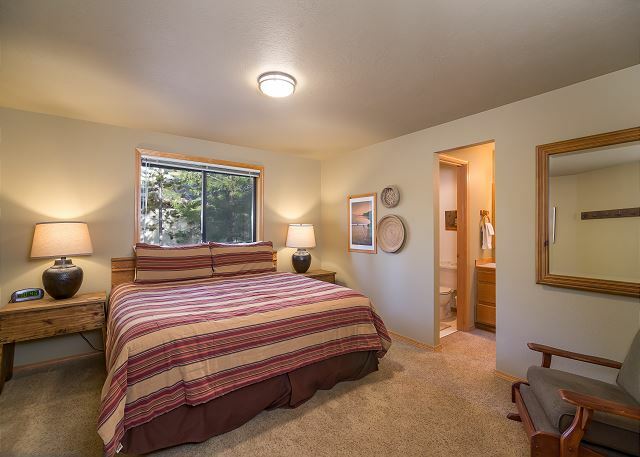 A ceiling fan in the living room would've made all the difference, and some box fans for the bedrooms. The couple nights there was some breeze outside it wasn't an issue but the rest of the days when the air wasn't moving outside, it was really rough inside especially with two little kids trying to sleep. Other than this, it was a great house had everything we needed excellent location very fun. Hi Serafina, we are glad that you enjoyed your stay except for the A/C issue. Our maintenance staff is available 24/7 and would have promptly brought out a few fans to get the air flowing for your stay for future reference. 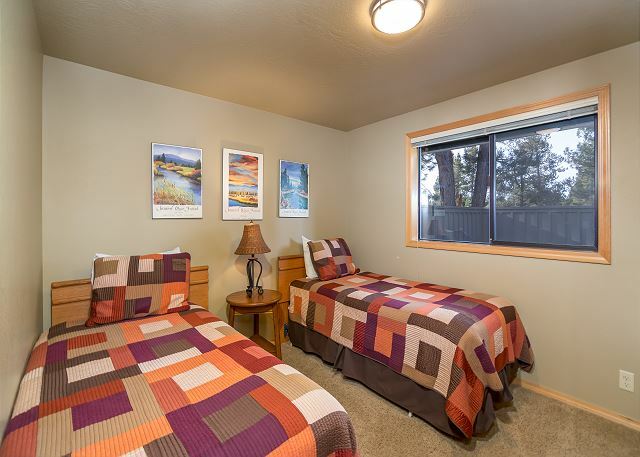 We do hope you visit us again soon in Sunriver. Everything was great. We had to call management once and they came right out and fixed a problem. Thanks so much for the review John! We were happy, as always to come out and help with any situation. 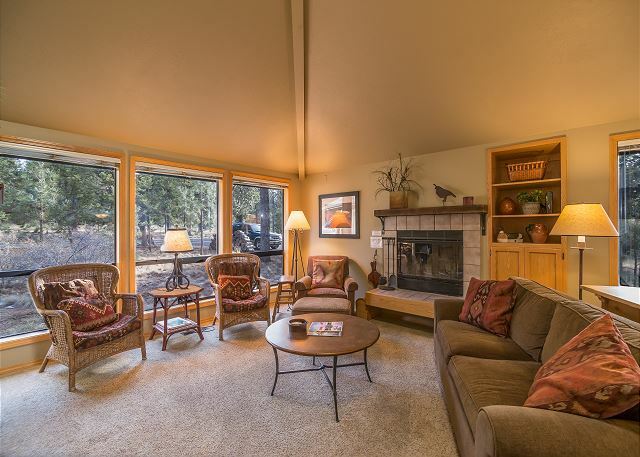 We hope you visit us again in Sunriver soon! Layout of house was great space for our 2 kids to play. Bikes were just right. Easy enough to drive to SHARC. Beds were very comfortable. Top of the line washer/dryer. Will stay again next time. We are happy you enjoyed your stay, Allison! Hart Mt #5 is a favorite! 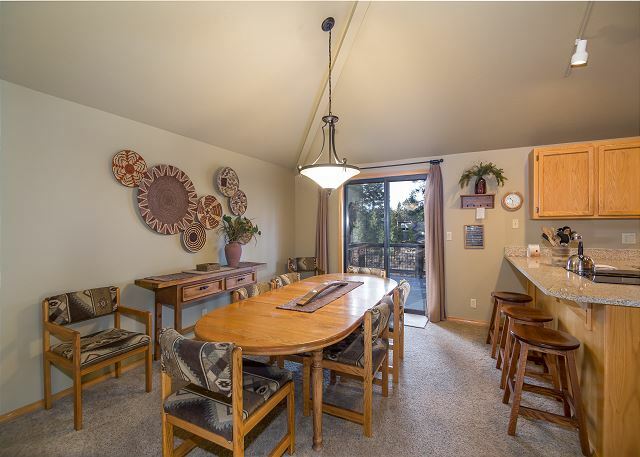 Come see us in Sunriver again soon! A couple of interior lights were burned out. Several buttons on the microwave did not work - which made using the device very challenging. Appears the left front burner on the stove top did not work. Loved the fireplace, beautiful setting, quiet and relaxing, easy access, easy to find - would go back. Hi David, we are happy that you enjoyed your stay. In the future, please call us immediately with any kind of maintenance issue. We have a our maintenance crew available 24/7 for your convenience and they could have came out and swapped out the microwave, lights and also looked at the stove. We appreciate your business and hope to see you in Sunriver soon! Thanks for the great review. We are so happy to hear that you had a excellent stay with us. Come back again soon! Had a lovely time at Sunriver, the the house was perfect and had all the amenities we were looking in a rental. 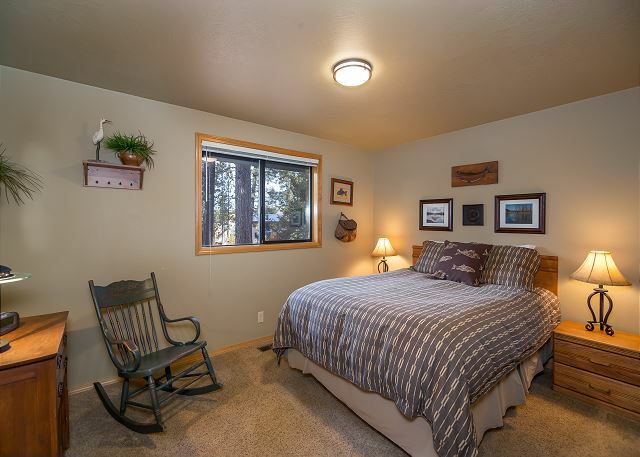 I will recommend this house and rental agency to all my friends when visiting Sunriver. We had a very relaxing time. The house was very comfortable and beautifully decorated! Our grandson really enjoyed the Sharc too! This was a great place to spend a week: comfortable, roomy, and all the amenities. We appreciated the fenced-in deck, which kept our little dog safe. So glad to hear this, Carl! Please come back to Hart Mountain 5 again soon, we loved having you visit. Thanks for this excellent feedback, Kathy! We'll take your suggestion on the mattress pads to the owners. We really appreciate the opportunity you've given us to make Hart Mountain 5 even better! Hurry back to Sunriver. This was our first trip to sunriver and we loved it! This house was perfect for our group and was a good location as well. Highly recommended. Sunset Lodging did a GREAT job of responding to our service call - there within 45 mins. 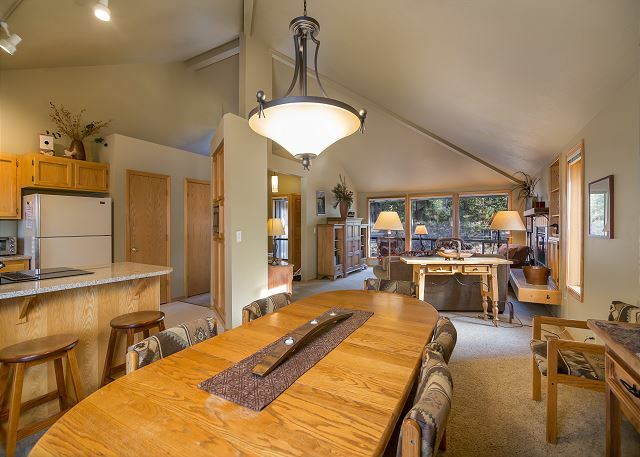 This property was perfect for our family of 6!